BLS takes great pride in the quality, reliability and durability of their excellent OEM and aftermarket products. Learn how their products can meet and exceed your expectations. 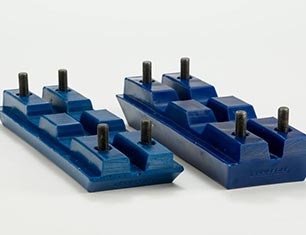 Easy-on, easy-off, poly track pads last two to three times longer than rubber track pads! Because bolts are molded right into the pad, the track pads easily bolt directly to the grousers. Pre-drilled triple grousers are made of high-quality steel. With 25% more material comes 25% more wear! BLS Poly Bolt-On TUFPADS HIGHTOP Track Pads are thicker, more durable and longer lasting than traditional track pads. They protect surfaces and provide the traction needed for your machine. Customers have milled over a million square yards of asphalt as deep as 14 inches before needing to replace these track pads. 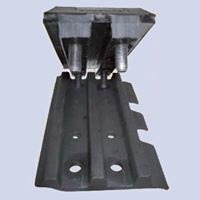 With more than 25% material than the standard pad, contractors are saving a great deal of money relying on BLS Poly Bolt-on TUFPADS HIGHTOP Track Pads. 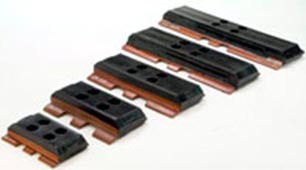 BLS Poly Bolt-On TUFPADS HIGHTOP Track Pads are also available as TUFPADS BLUES Track Pads. Made with blue polyurethane, these pads are proven to last up to 30% longer than the original black polyurethane. 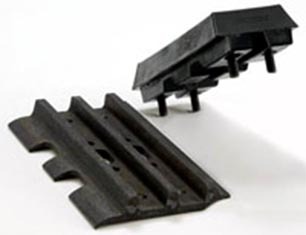 Longer wearing track pads, with great traction, saves you money on replacement parts and labor costs! After extensive field testing, BLS introduced TUFPADS BLUES Track Pads for contractors wanting longer wear time for especially rough applications. The hardness of the pads is the same as the black TUFPADS Track Pads. It provides the same traction and protection. What's different is an additive in the blue polyurethane that makes it more abrasion resistant. TUFPADS BLUES track pads reduce how often you have to replace your track pads. They are proven to outlast even premium polyurethane by 15-30%. Some contractors have reported a wear increase of 50% or more. This greatly reduces the cost of replacement parts and labor. 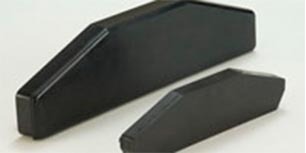 TUFPADS BLUES Track Pads are specifically designed for asphalt milling machines and other extreme applications. Choose standard or HIGHTOP BLUES Track Pad design. A longer operational lifetime than most OEM-supplied rubber track pads! BLS Paver and Dozer Pads are a cost-effective solution for traction and surface protection. The pads are manufactured with a higher quality rubber than most OEM-supplied rubber track pads, giving them a longer operational lifetime. BLS Paver and Dozer Pads are more economical than premium polyurethane TUFPADS Track Pads yet hold similar traction and protection characteristics. Stabilizer pads for every budget! BLS Stabilizer Pads protect against damage to streets, sidewalks and pavement from backhoes and other machines with stabilizers or outriggers. Stabilizer pads also ensure machines have a safe solid grip on street surfaces. Two types of materials let you choose the stabilizer or outrigger pad that meets your requirements. In-stock stabilizer pads usually ship within 24 hours. With a strategic Midwest location, BLS shipments arrive faster to all of the contiguous 48 states.